Oklahoma State Regents for Higher Education, 840 Research Parkway, Suite 450, Oklahoma City, OK 73104. Remote (Zoom) Attendance NOT Available for this month’s meeting. 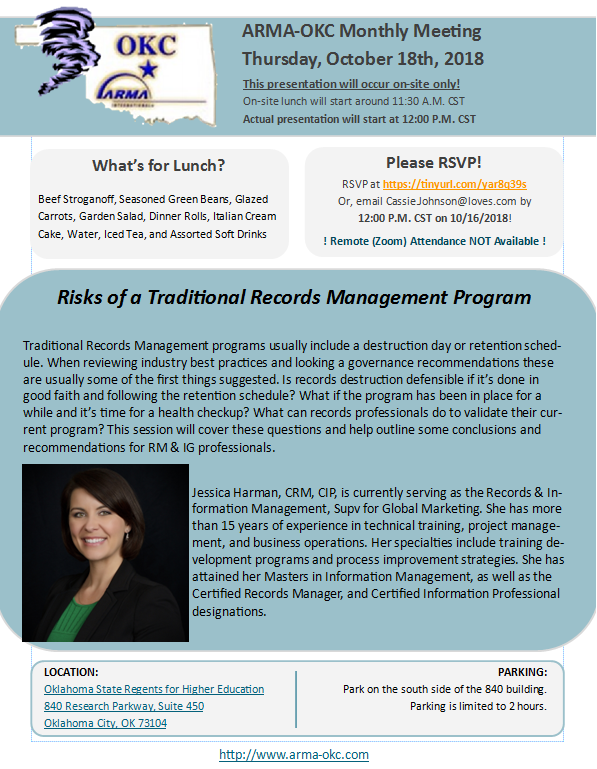 For a session all about Risks of a Traditional Records Management Program! Traditional Records Management programs usually include a destruction day or retention schedule. When reviewing industry best practices and looking a governance recommendations these are usually some of the first things suggested. Is records destruction defensible if it’s done in good faith and following the retention schedule? What if the program has been in place for a while and it’s time for a health checkup? What can records professionals do to validate their current program? This session will cover these questions and help outline some conclusions and recommendations for RM & IG professionals. Jessica Harman, CRM, CIP, is currently serving as the Records & Information Management, Supv for Global Marketing. She has more than 15 years of experience in technical training, project management, and business operations. Her specialties include training development programs and process improvement strategies. She has attained her Masters in Information Management, as well as the Certified Records Manager, and Certified Information Professional designations.